Every year we receive places for Cadets to fly in the Grob Tutor at RAF Woodvale, our local Air Experience Flight (AEF). The Tutor is an excellent two seat training aircraft. Each Cadet gets one flight of around 25 minutes each year, which builds on their previous flying experiences. For beginners this will mean taking the controls to do simple turns, or just getting used to being in the air. For the more adventurous there are aerobatics to try, as well as following the pilot through on take offs and landings. For keen Cadets there is often additional flying available, so keep a lookout. Beyond this the ATC offers a number of Flying Scholarships each year. Cadets meeting the criteria can apply for an AEF, Light Aircraft or Microlighting Scholarship or opt for the Air Cadet Pilot Navigation Scheme. You can apply for a Scholarship at any time throughout the year, but most courses are allocated in March/April. Successful completion of these courses entitles the holder to wear a set of wings. Gliding within the ATC is very progressive. We receive 6 – 8 gliding slots each year which enables Cadets to work towards their Glider Induction Certificate which teaches basic controls. 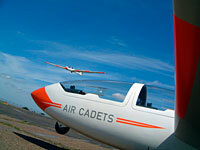 At 16 Cadets can apply for a Gliding Scholarship which takes them up to solo standard. This requires either a series of weekends at the local Gliding school or a week at the Air Cadet Central Gliding School. Through the ATC you will also get the chance to take to the air in a variety of different ways, there are opportunities to fly as a passenger in one of the RAF’s many fixed or rotary wing aircraft. You may also get the chance to complete a Microlight course or even parachute!